However, the Cascades are stunning! Reunited with Puff-Puff and Julien from the desert in Stehekin! Hikers just a week or so ahead of me had to make a tough decision since there was a trail closure at the Suiattle River due to fire. This closure had been in place for weeks and those of us hundreds of miles south had been stressing too. 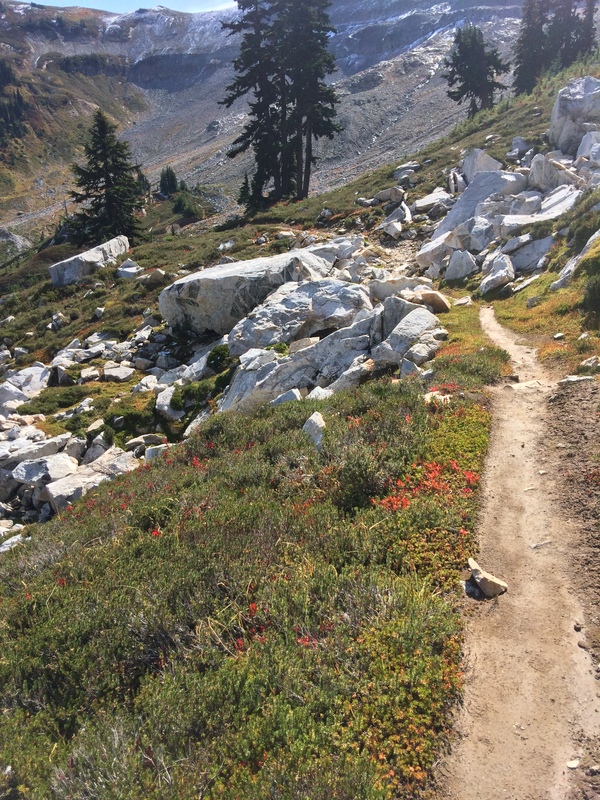 The most popular choice was to get a ride from Stevens Pass to Chelan, take the ferry to Stehekin, and resume the PCT, but skipping 107 miles of PCT. I figured that was what I would do and had lined up Sarah to drive me. And then the closure was lifted! All the crappy weather helped the firefighters. I am impressed that in the midst of dealing with the devastating loss of life and property and the complexity of fire logistics deploying resources and personnel, that the PCT was reopened to the tiny population of hikers. Who do I thank? The US gets so many things right: we invented National Parks, the Forest Service and long distance National Scenic Trails. Walking along I was thinking about this and humming “….land of the free, and home of the brave” guaranteed to choke me up like nothing else. If I’m ever cast in a movie and have to cry on cue, I won’t be thinking about losing my favorite cat, I’ll be visualizing an Olympic award ceremony with the US flag in the gold medal position and some poor athlete stumbling over the words of the anthem, hand on heart. I got a slightly late start out of Stevens Pass, making just 16 miles till dark and a camp in the clouds. Over the next few days I could not make up the miles, only getting 20-22 a day. 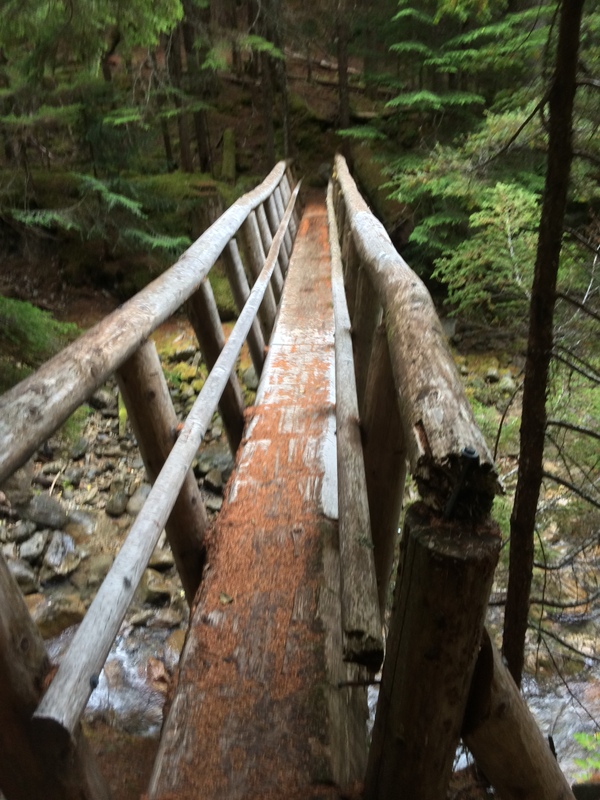 The trail was dreadfully unmaintained, brush overgrowing the trail pulling at my pack and drenching me with water. I couldn’t see my feet and was walking blind. Trees were down, years and years of trees, that I had to scramble over, under, or around. The trail was a rocky rut for miles and I picked my way slowly along, it would not be good to get injured so close to the end, plus how the f would Search and Rescue reach me? So I was 5 nights out, instead if the 4 I’d hoped for. A quick 7 mile walk to the Ranger Station where a bunch of us got the shuttle bus to Stehekin with a stop at the most incredible bakery of the entire trail. All you who know my real life eating habits would laugh to see me eat a sandwich, a Dr Pepper, a slice of Quiche Lorraine and 2 blackberry cheese Danish. And I was still hungry. I got a room, and started all the usual chores: pick up the resupply box, inventory and make a list of what else to dig out of the hiker box (fuel, TP, more food) or buy at the little store, hang up and dry the tent and bag, shower, laundry, eat. And then I heard a voice I knew scream, “Catwater!” Just like a movie, Puff Puff and I ran to each other, arms wide. And there was Julien too! What a reunion! I last saw Puff Puff in Mammoth but follow her blog alexandramason.wordpress.com and had lots of trail news drifting back to me. Trail registers, where they exist, told me how far ahead she was, she just got faster and faster, and I didn’t. Puff Puff, from England, is one of my heroes. What strength and resilience this woman developed on the trail. 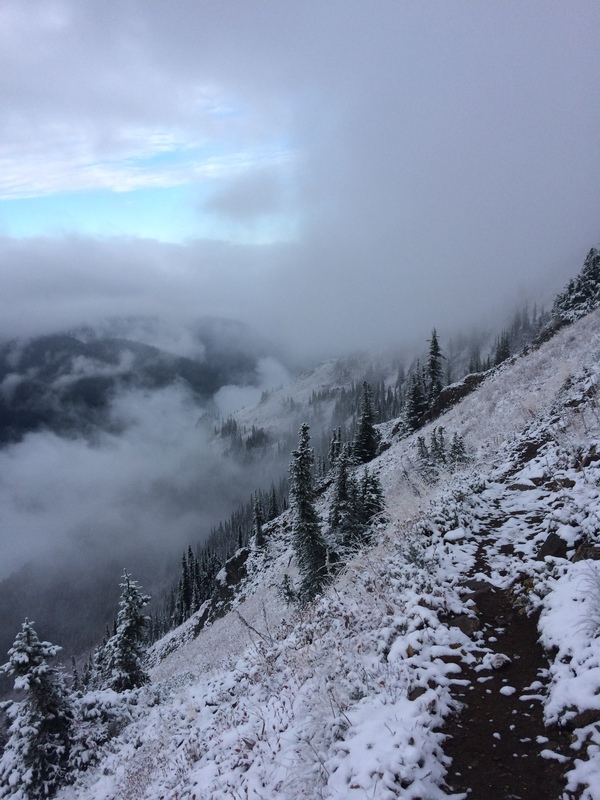 And although the trail closure was in effect when she reached the Northern Terminus, when it was reopened, she made her way back to Stevens Pass and hiked the 107 miles she’d been forced to skip. Not many hikers have done that. Julien I’ve been leapfrogging with since the desert. This man, from Quebec, has unfailingly smiled through the entire trail, all the fatigue, pain, hunger, there he is, cheerful, gracious, amiable. Waiting for the single washer/dryer in Stehekin, a bunch of us beautiful, scrawny, tattered, shaggy, tired hiker trash sat outside at a picnic table drinking beer and talking about making it to the final resupply before The Border. I was happy to learn that a couple who met on the trail, that I met in Sierra City, will be a couple in post trail life! And Sunshine recovered from a badly swollen shin in Crater Lake and will finish the PCT. Oh I love trail life and all the interesting unique individuals who have walked this path. Even though I am so ready to be done! This final leg, I planned very carefully to climb high and sleep low, so as not to freeze at night. The first night the rain held off till 4pm and quit at 4 am, a long enough dry spell that my tent was dry when I packed it. And then, miracle, the skies stayed entirely cloud free for the next 3 days, 2 nights to Manning Park. The northern Cascades, all the Cascade Mountains really, are soul freeing. 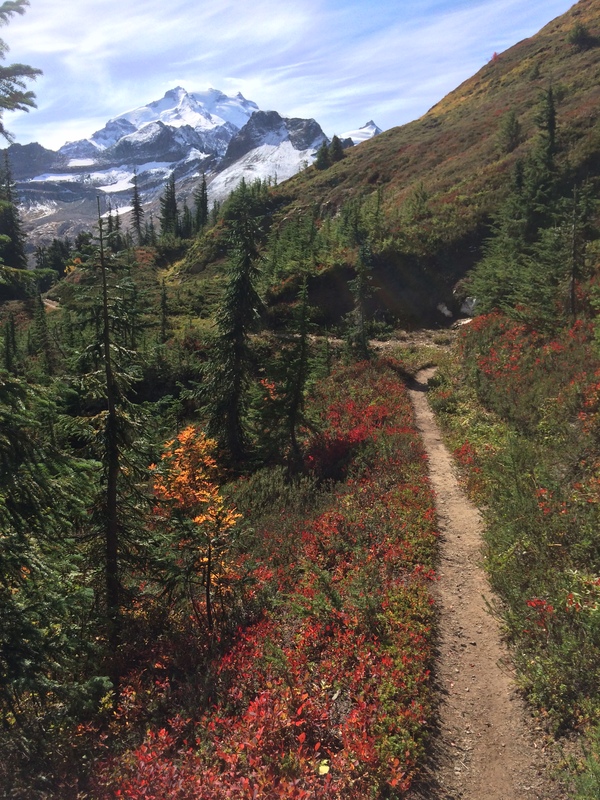 In the alpine, the blue sky contrasts with the high white hanging glaciers, glacial moraines, and fall reds, oranges and yellows. Below, the lush rain forest, Devil’s Club leaves as large as garbage can lids, ferns, maple, cedar, the stink of low bush cranberry and decaying plant life. Winter is coming. I passed the Doobie Brothers and 2 other thru hikers heading back to Harts Pass. Not everybody enters Canada after making the Northern Terminus of the PCT at The Border. 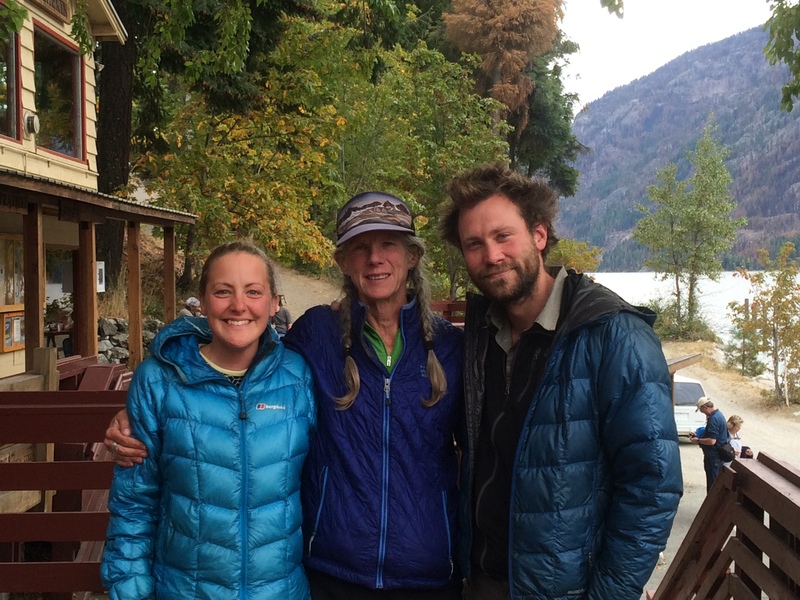 Big grins, we all congratulated each other on thru hiking the Pacific Crest Trail from Mexico to Canada. On my last day, less than a mile from Manning Park, Dan comes striding down the trail towards me, a little misty eyed behind the grin. I confess I was too. I did it! How is it possible I made it to the end? So many did not. I felt content when I got to Kennedy Meadows south, 700 miles of The Desert behind me, the portion of the trail I was most intimidated by. All the miles and country I traveled through after that were bonus. I saw my Dad, devastated by dementia in late June, and kept hiking. I got off the trail in late July to gather with family in the wake of his release from a life he didn’t want, and got back on the trail a few days later. I sprained my ankle in Oregon and kept hiking. 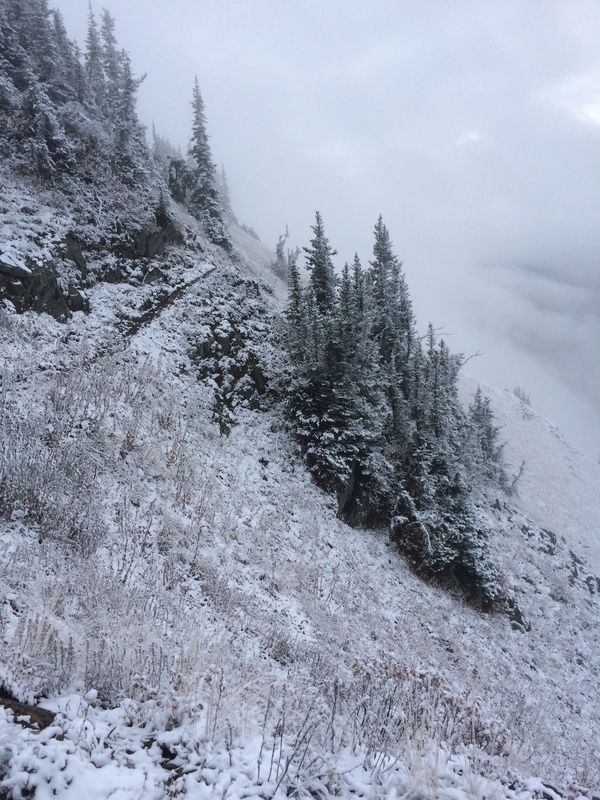 I flirted with hypothermia in Washington and was fully miserable, stalled out in White Pass, but headed back out on the trail. Velcro and I talked about what it took to hike the whole trail, he concluded it is 50% physical and 50% mental. I think it gets more and more mental when the going is tough. I know that I had to toughen up mentally and that what gave me strength was love. You, my family and friends, old and new, gave me power through your love and belief in my ability to finish this long, long trail, you all are part of this journey. Life is meant to be lived with people. Life is meant to be lived with love. Just beautiful! You have a way with words my friend. You did it! You conquered! You are strong! You are Catwater! Beautiful pictures. Beautiful words. Beautiful person. Congratulations, again, Catwater. You did it! love the idea of you walking through those wondrous cascades, ….. a land of contrasts of color and light and elevations, complete with all those giant snowcones. hugs and congrats. cheers, looking forward to a celebratory toast. Congratulations Catwater on a trip well done. You did it! Loved following you on your blog and we chatted up on the PCT near Separation Creek in Oregon’s Three Sisters Wilderness (two oldish guys). What an adventure you’ve had — and the people. Wow. Congradulations Catwater! You are a true PCT thru hiker and not a poser of the many who say they are just because they have walked parts of this grand trail. The satisfaction must be great. A bow and hats off to you. Such an awesome journey. You ROCKED it. Crying now..Every aspect -perfection! Thanks for taking us along through them all. Thanks for joining your old friends and new, I am sure I am not the only one who feels I have come away from your trip with new friends as well. Congratulations on your achievement, Catwater!